Food pantries are a great resource for many but some lack the transportation to get to their local pantry making mobile food pantries a great way to serve those in need. Mobile food pantries with fast and flexible delivery can also provide a better opportunity for perishable foods to be distributed. Your Girl Scouts can learn more about mobile food pantries serving those in or near your community and find out ways to assist. 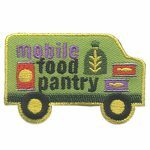 After their service, your girls will be proud to wear the Mobile Food Pantry patch.